Discussion in 'Flat Earth' started by Mick West, Dec 12, 2018. This rather long (1 hour 40 minutes) video from "Dr John D." documents some observations he made from the end of Worthing Pier to Brighton, 9.6 miles away. 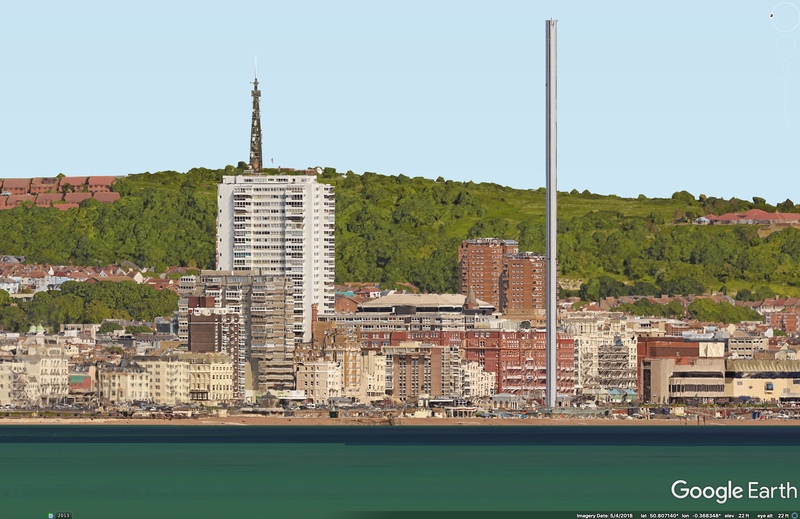 It's particularly interesting as Brighton now has a very distinct marker in the form of the i360 observation tower ride, a 450 foot high tower with a viewing pod that slides up and down. The i360 tower is on the right. The tall building is the Sussex Heights apartment building, behind the Hilton Hotel. Quite a bit of an angle. Now the immediate observation here is that the beach is missing. There's a chunk of the view cut off by the horizon - globe Earth proved! How did he get there? It seems to be largely based on the visibility of the traffic lights (the height of which above the actual water he seems to have miscalculated), and the assertion that there can be no refraction over the water in the evening. This is a great viewing location, with the i360 there so you know exactly where you are looking. You are getting refraction though, and you can prove this by looking at the aspect ratios of the buildings. They get more vertically compressed as you get closer to the horizon. Any observations that are really close to the water are going to have refraction issues (think back to the Bedford Level). So to do over-water obscuration tests you really need over 20 miles. 1) The detailed analysis of stills you did from the video footage that clearly show beyond reasonable doubt (to anyone) that the buildings become more vertically compressed as you get closer to the horizon /ground, which is your claimed proof that downward refraction is occurring. But to the first one. What I like to do in cases like this is create a "pseudo flat earth" view from Google Earth, basically just raising up the viewpoint a few feet, until you can see the beach. Here's an HD image from Google Earth of the "pseduo flat-earth view". We can see faily obviously that the horizon is obscuring a goodly chunk of the view. we can also see that the lower part of the image is slightly compressed, this is quite a subtle effect, and you see it best when looking at the enrtire image. The image has been aligned with the top left corner of Sussex Heights, and then scaled so the other building line up. If there was not atmospheric refraction then everything would line up vertically, but as it is there's a very slight rise of a few feet of the very lowest visible points. I invite people to try it, it's interesting how little of a temperature gradient it takes to make things be visible. He focusses on the spacing of floors within buildings but uses criteria of "noticeable" rather than "measurable, but you are unlikely to be able to see any local changes, and you need to look at the scene as a whole, as in the previous post. On the left is the "Flat Earth" and zero refraction view. On the right is the same view with a globe horizon, and some refraction sufficient to see the canopy of the Holiday Inn. The buildings are compressed, and more so lower down, but it's not "noticeable" looking a few floors on one building. It always strikes me that even when obstruction is apparent, any anomaly in how much is obstructed (vs globe expectations) is what takes priority from a flat earth perspective. The fact that obstruction is visible is often ignored. The claim is that the air at 1km (3,280 feet) is denser than the air at sea level. The problem with that is that air gets less dense as you get higher, as there's less pressure. It also gets colder, but that's a function of the expansion of the air - there are fewer air molecules in a given cubic meter. It is true that there can be an increase in density as you go higher if the sea (or the ground) is warmer than the air an heats up a layer of air above it, but standard pressure and temperature lapse rate takes over pretty rapidly most of the time. The red building in the center is the Hilton Brighton Metropole hotel, and the white on on the right is the Grand Brighton hotel. The images are aligned at the white roofline of the Hilton. There's a noticeable compression of the darker image, especially near the ocean horizon. In the later (darker, redder) shot there's far less compression (if any), there also seems to be a bit more visible. Do you know the timestamps for those two images? Here's a handy image for comparison. The front of the Metropole, seems relatively square on, bottom of the image is cropped exactly at the street. Are they actually very slightly different images? Or is it because his is minutely cropped, and therefore 'zoomed'? Well, you can see his image is a few pixels taller than mine, so I'm not sure why he expected them to be the same. But the pixel size is irrelevant when comparing within the image. I "enhanced" the image by using the "dehaze" filter in Photoshop. This does not change the positions of pixels, just their color and brightness. It's a few pixels taller, but also slightly cropped and 'zoomed', which maybe explains why they're not aligned. The best way to tell is that his has much less water at the bottom. Maybe the guy who can't see just needs to open his eyes? There's three fundamental errors in the above slideshow. The first is that the obscuration of a light when you walk down the beach is best explained by it being behind the horizon, so that should be the first explanation disucussed. But let's leave that aside, as we are dealing with people who think the Earth is flat. The reality is that a light radiates in all directions, there's no such thing as a "ray" of light, If you move up or down you can still see it, regardless of the curvature. Finally, he (seemingly) greatly overestimates how much light is curving. Typical refraction is a curve about 1/6 as curved (i.e, 6x the radius) of Earth. Extreme refraction is equal to or greater than the curve of the earth, we are dealing here with fairly normal refraction, so let's use an upper limit of the light curving the same as the curve of the earth, as we are familiar with how to calculate that. Simplistically the old 8" per mild square will give you the ballpark. So if we were to move back slightly (say 1 foot), then that's 1/5280 miles, so 8 * (1/5280)^2 = 0.0015 inches. That's how much a "ray" would curve down if it were to be curved as much as the Earth is (an extreme case). So to do his test you would have to move back 1 foot and down about a thousandth of an inch. Obviously, this makes no sense at all. The visibility of a distant light is a function of your eye height above the ocean, the atmospheric conditions, and the distance. For a large distance, small changes in that distance will have zero detectable effect. Small changes in eye height can have a significant effect, as they can cause the distant object to move behind the horizon. Of course, there's a huge range of possibilities, and the temperature of the air and water was only measured at one point, so we don't really know. However we can see in John's images, slight near-horizon downwards refraction in the first video, and less in the next one. Of course, he made it as hard as possible for himself by getting as close to the water line as possible, therefore maximizing the chance of refraction confusing any observation. From about 12 feet eye elevation at Worthing, the top of the cliff should just be visible. But crouched down on the beach, it should be invisible. You could then go up to nearby Cissburg Ring, 600 feet up, from where you will be able to see all of the cliffs. The text says 12 feet but the Google Earth data says 15.4 feet. Then the "crouching down" on the beach has the camera at 5.5 feet "above ground". Is the extra footage due to the way Google Earth calculates/works? It's just me ballparking the figures. The beauty of a long distance observation or large objects (really the cliff here) is that approximate viewer heights will work. So here I'm suggesting "on the beach near the water", "on the pier", and "on a nearby hill"
Google Earth is bit squirrely with the heights though, snapping to a minimum camera height of 1.67m, and with elevation data that is not always going to be precise at a given point. Again this is why longer distances and larger objects are better - in addition to avoiding refraction problems. Interesting experiment Mick, or hypothesis I suppose given you probably didn’t actually do it in the real world. However, I am going to Petworth this weekend and might take an hour out to do the real world experiment, weather permitting. Not that I expect the results to differ much from your simulation. On a small correction it is the Cissbury Ring. That would be great! It’s useful to have a well documented collection of such things. There’s quite a few already, but having a variety also helps when you can suggest to people that they replicate it. "Of course, he made it as hard as possible for himself by getting as close to the water line as possible, therefore maximizing the chance of refraction confusing any observation." Surely the experiment was based on observations from as close to sea level as possible...and not how difficult the experiment was to conduct? Surely THAT is all that is up for review/discussion? Not 'somewhere else a bit like that' ? Why, exactly is the Bell Tout Lighthouse (about 24 miles from Worthing) in any way relevant to THIS experiment? Given the detail provided by Dr. John D. It's somewhat worrying this 'metabunk' appears as conclusive as.. Sorry if my first post seems a bit 'tetchy' but given the high esteem in which this site is held...I expected better. I think what Mick meant was that it's difficult to get a good and clear result by doing it close to water, rather than actually difficult to carry out, as this is where observations will be most affected by refraction - the same problem that scuppered Rowbotham on the Bedford Level. The globe earth viewpoint is that seeing objects 'over the horizon' when the observer is just above the surface of the water is what's expected on both models. This is why Mick suggested that he try those other spots in Worthing. Away from the surface of the water, the results should be much more clear. It's actually suggesting a way to provide a better flat earth proof: if he looks towards the lighthouse and can see down to the beach there, or the whole of the cliffs, or finds no difference in increasing his elevation by 12 feet, then it will be a much stronger claim. It's really about finding a spot where there would be an obvious difference in observations between the flat earth and the globe. I thought the suggestion to photo/film the cliffs was a good and easy one, assuming Dr John is local to Worthing, and wasn't just on a visit. Exactly. It’s about the worst place to try to measure the amount of curvature. So it really needs explaining why you’d do it at sea level when better locations are easily available. If the earth is flat, must we able to see the entire Brighton Seafront from Worthing Pier beach, regardless of any atmospheric conditions? I had a go at replicating your suggestion on Boxing Day. Sadly it was not to be as the weather was rubbish and very hazy, I forgot my binoculars and telescope, my camera battery was flat and the walk to the top of Cissbury Ring nearly killed me. Just to show my commitment here is me on the beach at Worthing. And here is me on top of Cissbury Ring at 574’ (somewhat breathless) pretty much directly above where I was on the beach. I will try it again when (a) the weather is better and (b) I am better equipped. File under Work In Progress. Anecdotally (I know, I know) you can see more of the coastline nearly 600’ up. I was not able to capture this using only an iPhone camera. Interestingly there is a wind farm a few miles offshore. John D might like to turn his camera on this from sea level, promenade level and as high up as he can get because the masts definitely get taller with height. Most of the time you would yes, but atmospheric refraction on a theoretical flat earth could obscure distant objects, although you'd need a warm ocean and cool air to do so. (and obviously it might also be foggy, but I don't think you mean that type of thing). As noted several times, observations close to the water level are not very useful, as refraction is significant, and hard to correct for. My guess is that proximity to the water and the setting sun 20° off the sight line from Brighton towards Worthington will make it difficult for the participants to produce conclusive results. A ROMER LED Rechargeable Handheld Searchlight/Torch will be secured to spirit level, that is secured to a tripod. The height of the bottom of the tripod to the single central LED of the searchlight/torch will be 1 metre (100 cm) or less. The height will be measured with a tape measure at the beginning of the experiment and videoed with a live time and date. The tripod-torch will be positioned at tide level. The mount of the tripod holding the searchlight will be moved into a position until the light can be observed by the camera at the opposite pier, at which point the position of the spirit level videoed (with a live time and date check). As the tide level will fluctuate throughout the duration of the experiment, the distance of the tripod-torch from the tide level will be measured at the start and end of the experiment. A 10,000mW Professional Green Laser Pointer will be placed and secured in the end of a 1 metre, 28 mm diameter copper pipe, which is secured to a tripod mount. A spirit level will be secured to the copper pipe. The copper pipe is used to limit the divergence of the laser beam. A cap at the end of the pipe with a small hole drilled in it will also limit the divergence of the laser beam. The P900 and P1000 cameras will both be tripod mounted. The P900 camera will be positioned at Worthing and the P1000 camera will be positioned at Brighton. The height of the bottom of the tripod to the centre of the camera lens will be 1 metre (100 cm) or less. The height will be measured with a tape measure at the beginning of the experiment and videoed with a live time and date. The tripod-cameras will be positioned at tide level. An Anwenk Three Level Axis Triple Bubble Spirit Level will be secured to each camera. Each camera will be positioned horizontal to the ground and the position of the spirit level videoed (with a live time and date check). To ensure that the correct light sources are observed a flashing code will be used. The code will be two short flashes, followed by two long flashes, followed by two short flashes. Each light source will perform this code if and when it can be observed. If during the experiment, a tripod (with a mounted laser, torch or camera) is no longer in contact with the tide, it’s distance from the water’s edge and height above tide level will be videoed with a live time and date. The temperature (0C) of the water will be measured using the laboratory glass thermometer. The thermometer bulb will be submerged in the water at tide level, next to one of the tripods, for at least 30 seconds and the temperature measurement videoed. The thermometer will be wiped dry, then using the height rod as a guide, the thermometer will be held 50 cm above tide level for at least 30 seconds and until the thermometer level has stabilised (stopped moving), at which point the temperature measurement will be videoed. The same procedure will be carried out at a height of 100, 150 and 200 cm above the tide level. The measurement will be taken at both locations and videoed with a live time and date. The Relative Humidity (RH%) of the air will be measured using the Preciva LCD Digital Psychrometer Mini Humidity Meter. The humidity meter will be placed just above tide level, next to one of the tripods, for at least 30 seconds and the humidity measurement videoed. Using the height rod as a guide, the humidity meter will be held 50 cm above tide level for at least 30 seconds at which point the humidity measurement will be videoed. All measurements will be videoed with a live time and date. The possibility of lives treaming the measurements is being discussed. Anybody present is welcome to record the measurements as well. Laser experiments are useless compared to visible light experiments, especially so close to the water. Why bother with a laser? Why not just use a powerful flashlight, far less fiddly. The The "ROMER LED Rechargeable Handheld Searchlight/Torch" is a 6000 lumen flashlight. The lasers have 10mW and 30mW, respectively. In light of the sun's position, I'd simply use mirrors, Brighton requires one, Worthing requires two since the sun is in their back. But I guess they also want to see some angles, hence the lasers, also their reputation for being straight? This is a different experiment to the one in the OP, and should be in a different thread. I'd wait until he actually does it. hence the lasers, also their reputation for being straight? Light travels in straight lines (refraction permitting), regardless of whether it is laser light or not. Any given light ray from a torch (flashlight) to an observer can be thought of as equivalent to a laser. The only difference is that a torch emits light rays in a wider range of directions, so more of the emitted light power will miss the observer. That means for a given output, the light intensity in a given spot will be less. The only difference is that a torch emits light rays in a wider range of directions, so more of the emitted light power will miss the observer. That means for a given output, the light intensity in a given spot will be less. Yes, there's something of a tradeoff, in that you can use a relatively low powered laser for long distances. But it's incredibly fiddly to line it up with the camera. If you are simply doing a nighttime obscuration test then you are probably going to have a much easier time with a 1000 lumen flashlight (which is similar in brightness to a car headlight, which we know we can see for many miles). This is a common issue, I should probably write a thread about it. I just saw that John D no longer labels the Brighton event as an experiment. That means he refuses to state a hypothesis such as "if you observe Worthing Pier from the old Brighton Pier at an altitude of 1m above low tide, a light at the altitude of 1m can be seen." I guess this means that there will be no flat Earth prediction, and the event is not science, it's just a get-together with activities that look like science, but aren't. Feinman would call it "cargo cult science". I don't see how a bit of copper pipe is supposed to provide collimation. It limits the initial beam angle to a provable 2*arctan((diameter of laser aperture+diameter of cap hole)/2 /length of pipe), and makes an appeal to intuition that the beam is straight. Assuming that the copper pipe shows no internal reflection, which is, well, debatable, unless the laser can be shown to be firmly aligned and exit the pipe with the cap off on a smaller diameter than the pipe. I'm not sure how that's helpful. Surely you can see that by simply shining the laser against a wall a few feet away, and observing the size of the dot. I could see how it would be helpful in aiming it though. Especially if you had a parallel tube. But really there does not seem to be any benefit over simply using a bright flashlight here. Well, we'll wait and see how well the hole is drilled and aligned with the source and how big "small" is. I'm still not seeing the pipe's function in all this though, a straight edge is just as effective and easier to achieve/prove alignment. But I predict, having seen this experiment performed by flatearthers several variations, the triumphant result that they will be trumpeting as "Glob eartherS DESTROYED!!!1!1!!" depends upon a complete absence of beam spread as if their drain pipe with a hole in were a perfect collimator. and makes an appeal to intuition that the beam is straight. I'm sure straightness of light beams is one of the things, along with flatness of water, flat earth trolls take as axiomatic. As an aside, if this John D really is a doctor he surely has the skills to research geodetic survey methods and if he's so committed to the cause he could hire the requisite equipment to do this properly and debunk the whole field of surveying as well as the shape of the planet. Which is to say, I don't know why I've allowed myself to get even peripherally involved in feeding yet another troll. Why not just leave both sides to their constant bickering on Youtube?